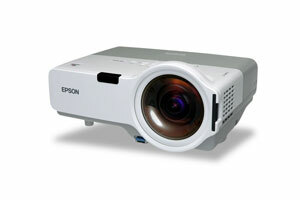 The Epson PowerLite 410W comes with a resolution of 1280x800 px that is ideal for classroom settings. It has a bright picture that is sharp and detailed, It also comes with an easy mounting solution thanks to the optional wall-mount arm. Connectivity options are excellent. With all of its features, it is one of the best options in the market for short-throw classroom projection. Size (projected distance) 50" – 116"
Dimensions (W x D x H) Including Feet: 12.9" x 10.7" x 6.2"
Excluding feet: 12.9" x 10.2" x 3.7"